For this challenge, it all about images, and how to add and use images in your blog. 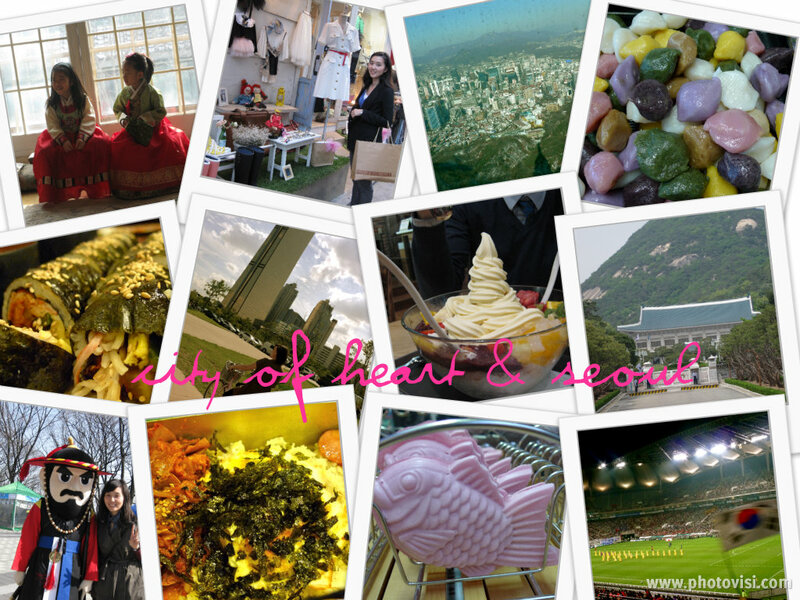 I decided to create a collage using photovisi about Seoul. There are so many things that I love about Seoul, so I’ve put together a few of my best shots of its delicious food, sights, and heart. It comes out clearer if you click on the photo. All of these are photos I’ve taken here in Seoul. I also had a lot of fun using animoto, a website that makes videos for you. You can make free videos that last for 30 seconds. As a teacher you can sign up for the education version to get longer videos! Some ideas that I’m getting for my classroom, is to make short video clips using animoto for things like field trips, publishing parties, big projects, etc. It takes very little time to make the video, but it looks really fancy! Also, it will be a good way to keep my parents connected to what’s happening inside the classroom. 1)Go to Wimp yourself and create your own character that resembles the Diary of a Wimpy Kid character. Save the image onto your computer. My students loved “wimping” themselves~! 2) Go to Fotoflexer to edit the photo if needed. Upload the file to the program and add some text or decorations. Save the file on your computer. 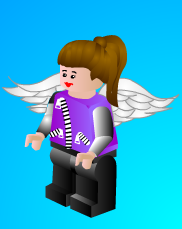 3) Upload the new file as your avatar. *I’ve also added an RSS feed to my widgets so people subscribe this blog to their reader! 🙂 Who else uses the google reader? I did a major clean up of my about page. I tried to make it more visually pleasing to the eye with two photo collages which I used photovisi, a great online photo tool for making collages! I took out the 3 big photos I had before. I included some more interesting pieces of information about myself outside the classroom. I wanted to keep it short and easy to read, so I used a questionnaire style. Since I’ve joined the edublogs teacher challenge, I’ve come across so many interesting teaching blogs. It’s like I’ve stepped into the whole new world of blogging and all it took was a few clicks! 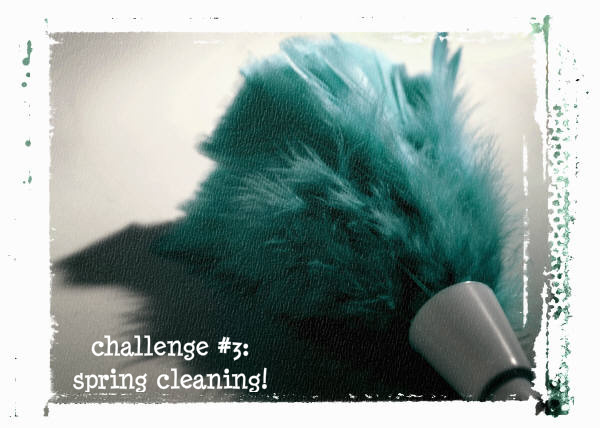 Challenge#2 is about writing effective posts. I really like the analogy that they give, that the post is like the heartbeat of your blog! 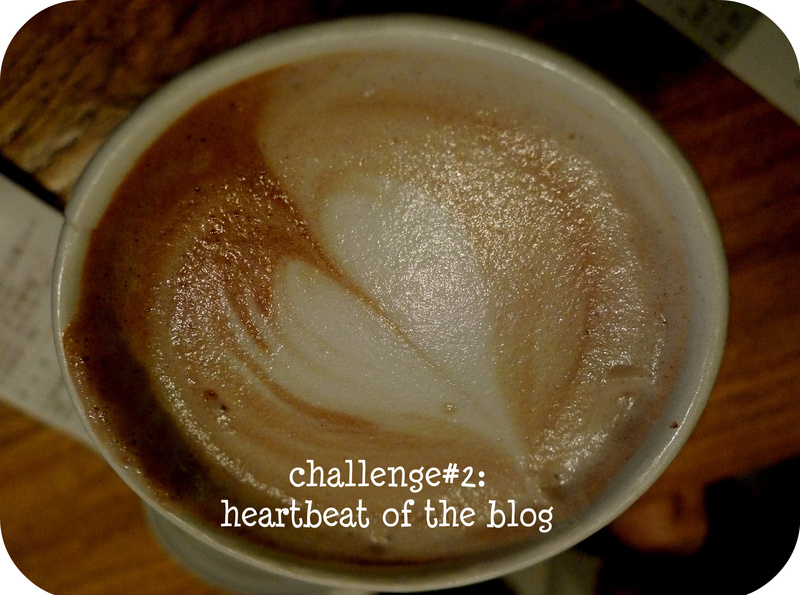 How to keep your heartbeat of your blog! 1) Paragraphs– You have organized your writing into paragraphs. I get lost when I see just a whole bunch of text without paragraphs! 2) Purpose– There’s a purpose to what you’re sharing. It can be useful to other teachers and educators. 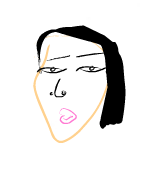 3) Pictures– There are pictures, photos, comics, clip art, etc that relate to your post. 4) Personal– You make your post personal in some way, whether it’s about an experience you had or something that is important to you. It can allow readers to connect to you as well. 5) Practice– The post gives you practical tips or spurs you to reflect on your practice as a teacher. What do you like to do to make your post effective? What makes you read other people’s blogs? I’ve decided to join the Edublogs teacher blogging challenge in an attempt to blog more this year! The first challenge that I’m going to complete is to write about my life as a blogger. It all started in a Barnard college dorm room, with an old Dell P.C., and xanga.com. Yes, I started my life as a blogger on xanga.com. (This was a blog site similar to what wordpress and blogspot is like, but not as complex and fancy in the late 90s to early 2000. ) I even managed to convince many friends to join as well. It was fun, exciting and kind of scary, putting your life out on the Internet. I loved posting photos and writing about all sorts of things of the typical college student. It was a good time and I think some people still do use it. That lasted a good number of years, but disappeared quickly. Now fast forward to 2010, where I decided to start my own teacher blog. 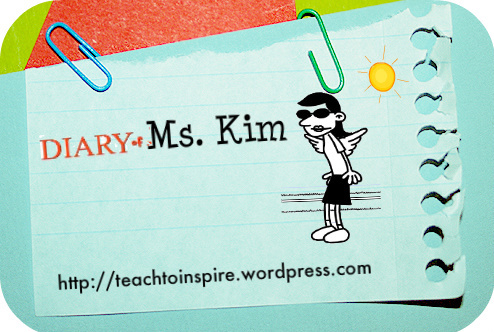 After a failed attempt to keep a food blog after moving to Korea, I thought maybe a teacher blog would be better. I think I was partly inspired after meeting Stacey, who has an awesome blog called Two Writing Teachers, at the Reading and Writing project summer institute this past July. 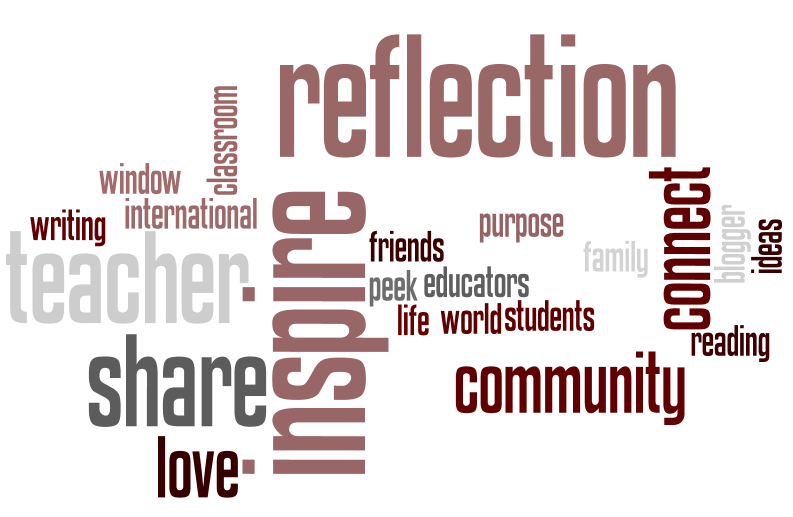 For the extension activity, I’ve created a wordle about the purpose of my blog~! This Christmas vacation, I had a chance to go to Cambodia on a missions trip through New Hope for Orphans. I taught Korean classes for a week, and my team mates taught English classes in a rural orphanage in Kompong Cham, Cambodia. I didn’t know what to expect at the orphanage in terms of teaching. I assumed the students would all be beginners. However, I found out they had been learning Korean for a few months and could actually read and write a little. My lessons that I made went out the window. I taught two one hour Korean classes a day, which honestly doesn’t sound like a lot. I mean I was used to teaching from 8:10 to 3:30pm everyday here in Korea. However, when you only have a dry erase board, markers and very limited resources, it can get very long! The first day, around 5:30pm, the room I taught in started getting dark as the sun went down early in Cambodia. Eventually they would turn on the generator and one light bulb would try to light up the entire room. I still had trouble seeing clearly, as my eyes weren’t used to the darkness. I started running out of things to teach during that first hour and I even I tried to end class early, but my Cambodian teacher and translator, kept telling me to go on! I scrambled through the old photocopied Korean workbook he had and found more things to teach. After that first night, I realized I needed to plan much more for those one hour sessions. I couldn’t just wing it. The second day, I played bingo with them. I was teaching them numbers in Korean and I had them make their own bingo sheets in their notebooks. They loved the simple game. The next day, a few of the kids from the village came early and I saw them sitting on a gazebo like swing. I asked them what they were doing, and they were playing “bingo” with each other! By the end of the week, I had a number of different fun things I did with them. I taught and played games like pictionary and bingo. I also taught them some origami and had them introduce themselves in Korean. The hour didn’t seem as long. Now that I’m back in my classroom here in Korea, I do miss my Cambodian students a lot. I’m also really thankful that I have lights that I can turn on and off when I want. They were all so engaged! 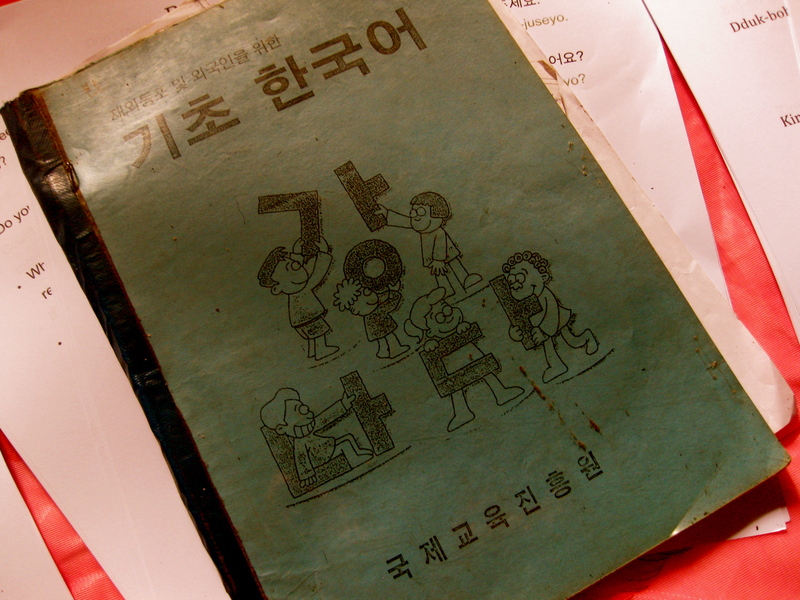 The Korean workbook that my translator used. Teaching with my Cambodian translator. All of the seats would be full!! 1. Presented on teaching the writing workshop at the Korkos conference (A professional development conference for international school educators in Korea). 2. Attended EARCOS conference in Manilla, Phillippines, and got to meet educators from all over Asia! Also, attended the ACSI conference in Suwon about Christian education. 3. Attended the Teacher’s College, Reading and Writing project summer institute for the second time and got two other colleagues from my school to attend as well. Participated in a weeklong writing workshop with James Howe (Author of Bunnicula series and more) at the summer writing institute. 4. Read many different professional development books that have helped change and improve my teaching practice including Teach for Champions, Hidden Gems and The Power of Grammar. 5. Participated in a collaborative team to rewrite our elementary science curriculum. 6. Planned our school’s first ever Daddy Daughter Dance! It was so cute seeing the girls dance with their dads. 7. I started mentoring a new teacher at my school, who also happens to be an amazing friend of mine!! 🙂 It’s so cool to help new teachers by giving them feedback and support. 8. Started my first “teaching” blog!! It’s so exciting to get feedback from friends that they read my blog. Thank you for reading this! I hope to blog more in 2011! 10. Turned many reluctant readers and writers into students that love to read and write! 3. Blog at least 2 times a week or more! What were some of your accomplishments as a teacher in 2010? What do you want to accomplish in 2011?